B.A.P YES SIR! decided to join this cute project from BABYz.com, a Japanese fansite. The fansite's owner, Nokko, said she would love to receive contributions from International BABYz too. Read the notice below and please support the project! Project: Collecting Messages for B.A.P Live on Earth Japan! 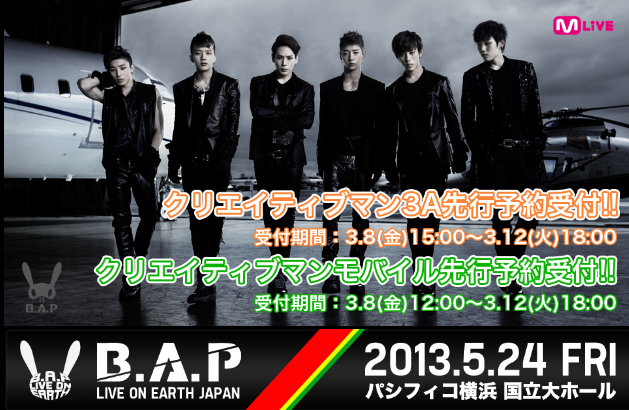 Fans have until May 10th, 11:59pm to send their messsage to B.A.P for the Live on Earth Japan show! The theme is: Congratulations on your first Japan Concert!! BABYz.com is collecting messages in the form of handwritten postcards, digital collages, and simple e-mail messages to create a "Message Album" to give to B.A.P so they can have fond memories of their Japan Concert! 1 message per person please. If you want to write a message to an individual member, please make note of that and the site owners will arrange it as so in the album. This you will have to mail to Nokko-san. Continue reading below for details. * I'm pretty sure if you type up a message, the number of English letters and kanji characters doesn't change much, so the 100, or 1-20 characters should hold for English messages as well. Please only 1 message per person! We want to send B.A.P messages from lots of people!! And the focus is on congratulating them on their Japan concert, but any other well wishes added are welcome. If the size of your message (for handwritten format) is the same size or smaller than 100mm x 148 mm (around 10cm x 14/15cm), the paper you choose is up to you. Those choosing pattern 1 or 2 for their message, please be aware of this! If you want to use images, please get them from news sites, your own fancams, member selcas, and other sources besides the official images. Try to keep your message papers around 3mm thickness. It's okay to cover it with lots of stickers, drawings and what not, but please think about how many messages will be gathered and if they are all very thick it will be difficult to make an album, and be careful anything you paste to it won't fly off or get broken. Do not post any of your personal information within your message. Phone numers/etc. and other information is not allowed. Things like "From Hanako Yamada" is okay. If you do write down other personal information, we will not be held responsible. Be certain to write your name in your message! Your name or nickname is fine so they know who it's from! For those chosing format 1 or 2 anywhere you write your name is fine, but for those choosing the 3rd pattern please include your name within the set character limit. EX: "Congratulations on your concerts! From Nicole." "To B.A.P, from ~" "I love you I love you I love you ~Nokko loves B.A.P with all her might!" For those choosing format 3, there are no prohibited characters, you can use emoticons, hearts, or hangul. But if it's very long it will cause problems so please stick to the 100 characters limit for your email message. Within your message, please do not slander any staff/anyone associated with B.A.P or any members or other BABYz. We want to give them happy memories, so congratulate them on their Japan show, tell them how much you love them, etc. Please don't forget to include "From BYS" to indicate you are an international fan since the BABYz.com staff may make 2 albums depending how many messages they get, 1 with messages from Japan BABYz, and 1 with those from International BABYz. For those of you choosing format 1, Nokko will reply with the address for you to mail it (but you have to cover any postage costs). For those choosing 2 or 3, you can send your pictorial/graphic/drawing or typed message to Nokko in the same e-mail with the above information. If there's anything you don't unerstand, or want to check before e-mailing your message, leave a comment below for Nicole, who will handle questions from international Babyz and pass them on to Nokko if need be (unless you know Japanese, then you can contact Nokko yourself ^_^). You can also contact Nicole through email : nicole.korinetz@gmail.com. And have fun making your messages, whichever format you choose! Have fun! :3 And send me any questions you might have! if you want to send an email are you allowed to attach your own fanart along with it? If I chose option 1 can I put some fan art along with it, if the mentioned size still match??? As long as the size matches, I don't see why not :3 Go ahead! if i wanna email a drawing,how about the size/dimension? As far as I can see, since they will be printing everything there, there are no sizes indicated since they will most likely just resize the images before printing them. 1.) Hand written message = a fan letter or note than you can write on stationary, a postcard, or even a drawing you have made (keeping in mind the size limits) that you will mail to Nokko-san. 2.) Image Message = this is something you will email. Think of it like a photoset like the ones you see on tumblr (for example: http://dailydoseofbap.tumblr.com/post/45666100094/realb2ng-byzelo-instagram-pics-c-owner ) (they ask that you don't use official TS images, rather use internet news sites like Yahoo Japan or member selcas) or a fanart you have drawn and scanned or drawn in digital format. You can include a short message as well (like "I love you B.A.P!" - Nicole) either ON the message or included in the email as simple text, and they will print it out to put in the album. 3.) Written Message = Basically an e-mail to B.A.P that you will email to Nokko-san, and they will print it out and put in the album, no pictures or anything to decorate it. what language should i email her? english or japanese?